The Casper mattress, according to the company, is better than any other brand due to the one-of-a-kind ergonomic alignment, the premium foams for luxurious comfort and the airy layers which keeps you nice and cool while asleep. How much does a Casper mattress cost? NOTE: These prices are as of 2018 and are subject to change. Use this as an estimate only for reference purposes. All shipping and returns are free in the United States and Canada. Pillows: Bed pillows range from $75 for a standard to $95 for a king. According to the company, the pillows are filled with nearly a billion coated fibers, creating an adaptive liquid-like feel that is able to respond to your movement while you sleep. The outer part, offering a plush and cushioning feel, features longer fiber, with each individually blown into the cover. Sheet Sets: A standard sheet set, depending on the size, can range anywhere from $100 for a twin to as much as $170 for a king or $190 to $310 if you wanted to add a duvet cover. Each set, coming in a variety of colors, is available at local Target stores or via online and will include one flat fitted sheet, one fitted sheet, and two pillowcases. If you don’t want the set, then you can purchase either the duvet cover separately, starting at $90 or the pillowcase set on its own, which starts at $50, again, based on the size. Down Duvet: The down duvet insert, made of breathable cotton, is said to be the best temperature regulator out there, according to the product’s description, making it comfortable for any season. A twin will retail for $250, a queen will retail for $290, and a king will cost $350. Mattress Protector: Ranging from $85 to $105, depending on the size of your mattress, the Casper mattress protector keeps your mattress looking like new by protecting it from any stains, spills or from simple wear and tear. Using the same material premium outdoor gear uses, this protector is small enough to keep the spills out but large enough to let the air in, allowing your mattress to stay cool and clean. Bed Frame: Designed to work with the mattress foundation, this 100% recycled steel bed frame can range from $95 for a twin to as much as $125 for a king. Dog Mattress: Aside from the mattresses made for humans, the company also offers a dog mattress for a variety of dog sizes. 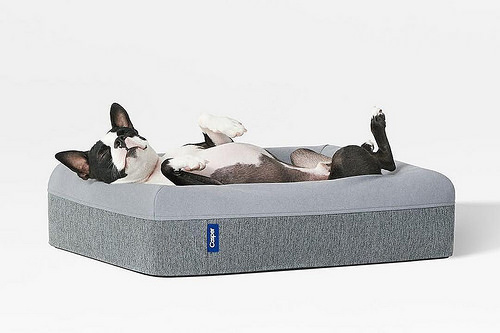 Designed by the same engineering team who created the sleep products, the dog mattress, ranging from $125 to $225, offers the same sleep surface and return policy. Mattress Height 9.5" 10" 10"
The company works with the financing company, Affirm, to help break up your payments into flexible monthly payments as little as 0% interest and $84 a month. All mattresses, as per the company’s warranty page, come equipped with a 10-year limited warranty. To test the mattress, some Target locations have begun to allow you to try it in person.